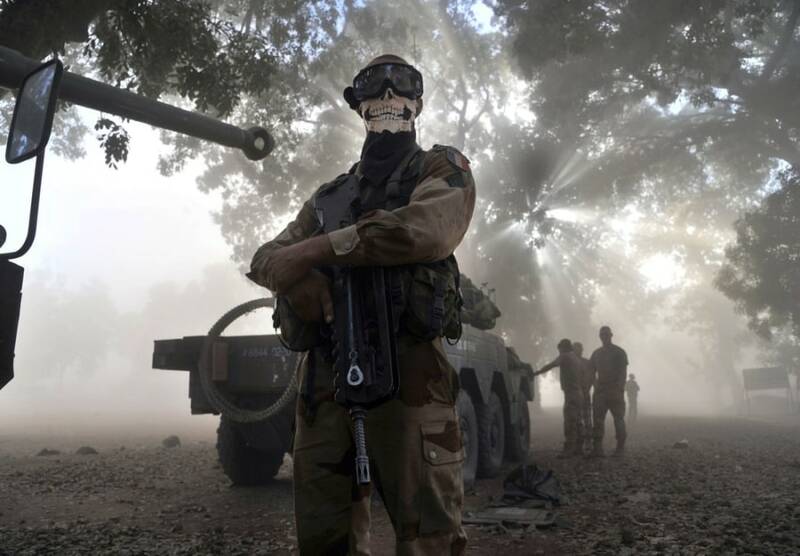 A French soldier wearing a skeleton mask stands next to a tank in a street in Niono, Mali. The image was taken innocently enough: A landing helicopter kicked up a dust storm as French soldiers moved toward Niono, in northern Mali, an area held by al-Qaida-linked militant groups. The soldiers pulled on their goggles to protect their eyes from the dust. One soldier pulled up a black bandana -- with a white skeleton face printed on it -- over his nose. Behind him, light beamed through tree branches, creating an otherworldly image -- the soldier looked like a skeleton in French military fatigues. Photographer Issouf Sanogo of the Agence France-Presse news agency and Yann Foreix of Le Parisien were drawn to the soldier, whom they photographed. The bandana is an accessory sold for fans of the violent military game “Call of Duty.” At first glance, the soldier bears eerie resemblance to the character Ghost from the video game. Two days after the images were published in newspapers and news sites across Europe, French military officials have announced that they aren’t pleased with the image, according to newspaper Liberation in Paris. France has been moving into the northern region of Mali to wrestle control of the area from militants affiliated with al-Qaida. French Defense Minister Jean-Yves LeDrian said over the weekend that the goal is the "total reconquest of Mali," and that the French military would not "leave any pockets of resistance." Mali is a Muslim country; those in the north are viewed as religious extremists. On the AFP blog, Sanogo, the photographer, said that nothing seemed too out of the ordinary about the image at the time. Military and video games have long mixed – the members of SEAL Team 6 were punished for their role in developing the video game "Medal of Honor." The U.S. Army created “America’s Army,” a series of video games to help with recruitment. But this image has a more chilling effect, somehow, perhaps because it signifies the conundrum of war: the liberating army as a symbol of freedom, but also of looming death.